December 1989 was one of the coldest months on record. It was very cold dark on the early morning of December 15 1989 when the sculpture Arturo Di Modica and his friends installed the huge 7,100 lb ( 3,200-kilogram) bronze sculpture in front of New York Stock Exchange. The night before Arturo visited the location and check the police patrol time intervals. He had a little bit more than 4 minutes to drop the statue. When the artist and his crew arrive next morning they saw a Christmas tree installed on the place they chose for the bull. So they decided to place the statue on the yellow center line of Broad Street, outside the exchange, facing Wall Street right under the tree, as a Christmas present. "Daylight brought crowds, and hundreds stopped to admire and analyze the bull, which was charging under the branches of a 60-foot Christmas tree, also set in the middle of Broad Street. Mr. Di Modica handed out copies of ''The Bull,'' a paean-in-a-flier to his work. ...Security officials at the exchange were calling the police. ''In effect, they told us there was a very large statue of a bull there, and it wasn't there yesterday, and to the best of their knowledge shouldn't be there,'' said Officer Joseph Gallagher, a police spokesman." 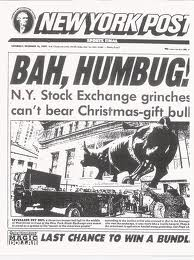 The pamphlet attached to the bull, started, "The Stock Market crash of 1987 was for many Americans an event frightening ..." The artist saw the bull , symbol of virility and courage, as the perfect antidote to the Wall Street crash of 1986. 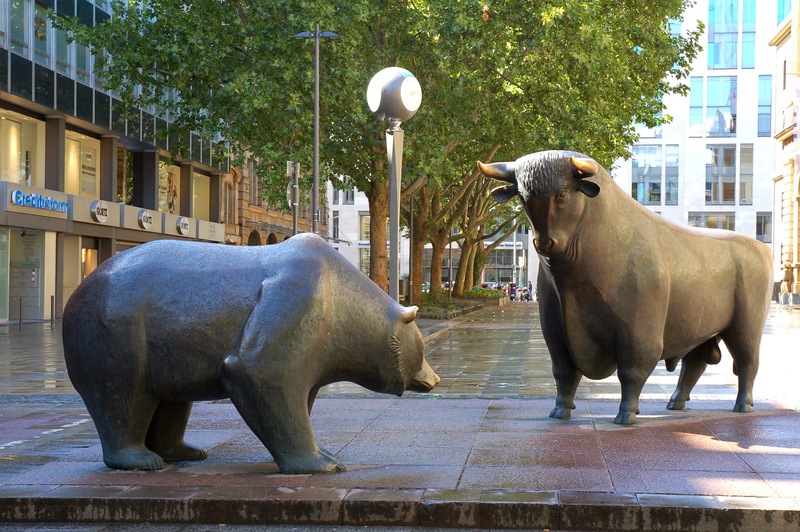 Bull markets are characterized by optimism, investor confidence and expectations that strong results will continue. According to Investopedia, "The terms "bear" and "bull" are thought to derive from the way in which each animal attacks its opponents. That is, a bull will thrust its horns up into the air, while a bear will swipe down. These actions were then related metaphorically to the movement of a market: if the trend was up, it was considered a bull market; if the trend was down, it was a bear market." company to move the bull away. It was a bad day for Stock Exchange- the price of the removal was $5000 and the Dow Jones index was down 14 points. The bull was saved by the senior office of NYC parks department who called Bowling Green association and suggested them to put the bull on the Bowling Green. Arturo Di Modica was born in Sicilia, Italy in 1941 and move to Florence in 1960 where he opened his first studio. In 1973 the artist moved to New York and rent a studio in SoHo on Grand Street. Later he built his own studio on Crosby Street where he had been working for the world-famous Charging Bull for over two years. The "Charging Bull" was the third - and at last successful - attempt of the artist install his own statues on New York streets without permit. In 1977 he dropped several marble statues in front of Rockefeller Center . The second time, in February 1986, he put a big bronze horse in front of Lincoln Center. "It was a Valentine's gift to all the people in New York who are in love," he said. In 1999 Arturo DiModica was selected for one of the most prestigious annual awards given in the United States the Ellis Island Medal of Honor. 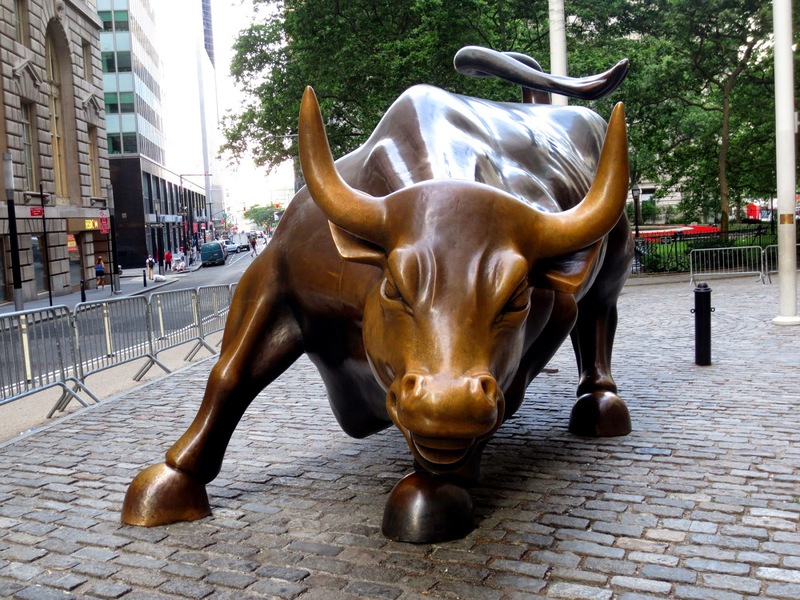 On the 15-year anniversary of its arrival on Wall Street, the "Charging Bull" Arturo DiModica put the statue for sell. The work cost US$360,000 of the artist's own money. The buyer must donate the bull to New York City with the condition that it remains at its location in Bowling Green park. The new owner's name will be placed on a permanent fixture created by Di Modica that will sit next to the sculpture. 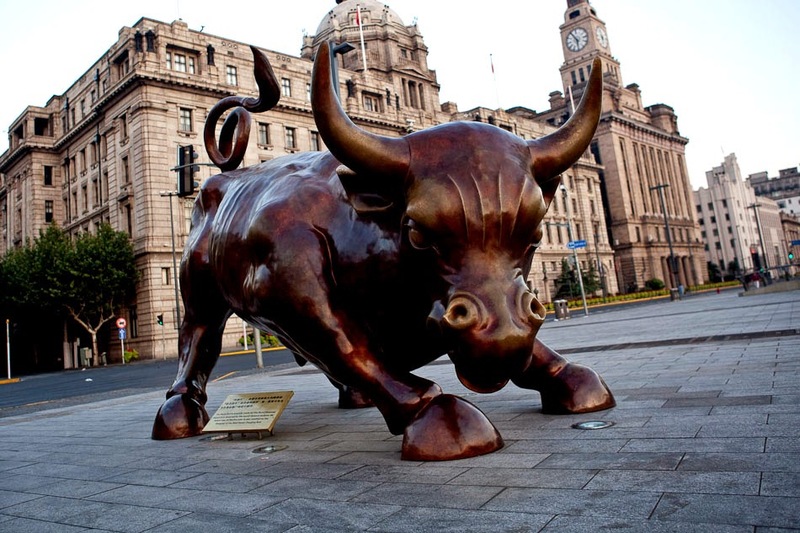 In May 2010 Di Modica installed similar version of the Charging Bull in Shanghai. WIKI said: "It is located in the Bund, which is considered to be a location that symbolizes the era of European colonial capitalism in China The bull is located in a square with four stock price screens across the river from the city's financial district. The newly opened square is being called Bund Financial Square. 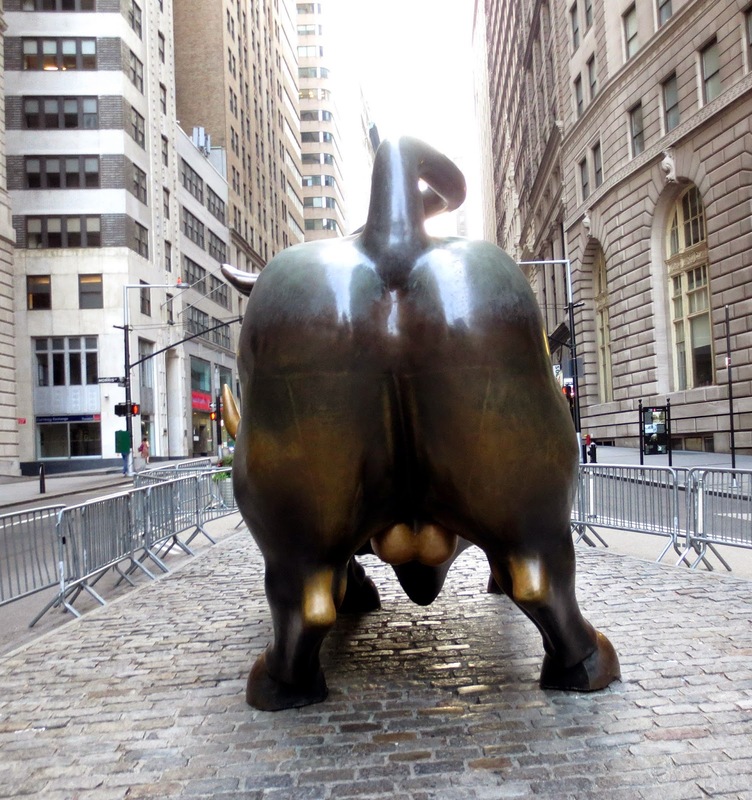 Like its Wall Street counterpart, the Bund Bull's male genitalia is rumored to produce good luck when stroked." Di Modica created the smaller, silver version of the bull that sits outside his friend Giuseppi Cipriani's Abu Dhabi restaurant, Cipriani Yas Island. The artist spent several days in the Emirates in March 2012, negotiating for possible locations in Abu Dhabi or Dubai for the bigger version. "If I could site a bull in the Emirates, the triangle for peace in the world will be complete," Di Modica. "I tell people; the bull is not fighting - it represents a stronger economy and consequently a better world for young people in the future." The Cipriani’s are collectors of Arturo’s artwork, and even gotten the artist to design two of their restaurants: Cipriani Dolci at Grand Central Terminal and Cipriani Downtown, both in New York. 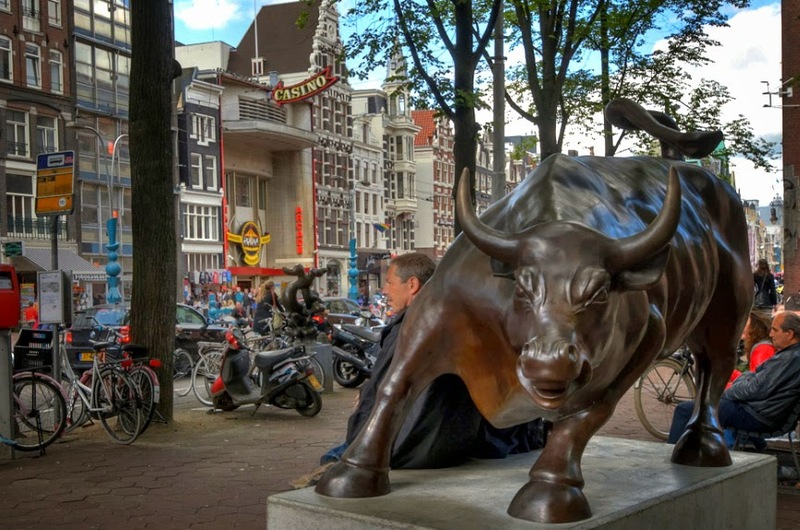 In July 2012 the artist placed a bronze statue of a bull, similar to his work in New York , in front of NYSE Euronext (NYX)’ s Amsterdam bourse overnight as an antidote to Europe’s debt crisis. “Europe is in an economic crisis. Think positive! Together we will go up!” read leaflets handed out at the square in front of the bourse by a spokesman for Di Modica. 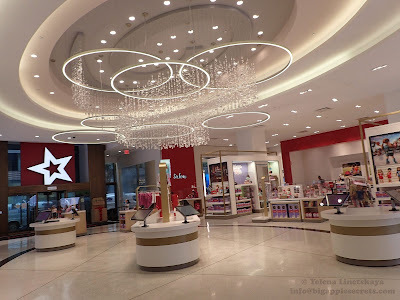 Last year in November Di Modica signed an agreement with Fernando Luis Alvarez Gallery in Stamford, Connecticut. Despite living in New York since 1971, Di Modica had never had gallery representation in the United States before. You can see now a stainless steel 8-foot-by-4-foot replica of "Charging Bull" alongside a stainless steel horse by di Modica on Bedford Street in Stamford. "It's been there for almost 25 years and now it is the mascot of the world," di Modica said about the Charging Bull. "It was not legal but I'm not killing anybody or robbing a bank. I'm giving my love to the people. I give them more happiness." There is a web camera installed near Charging bull- so you can see alwais see what is going on.